Liselle Batt of Western Maine Horseshoeing and Trimming at work last winter. A clinic by Batt on hoof health will be held in Wilton on June 22. EAST DIXFIELD - A farrier (horseshoer) is starting up a new business in the Farmington area with plans for a clinic to be held in Wilton on June 22. Farrier Liselle Batt has returned to the area and opened Western Maine Horseshoeing and Trimming on a 135-acre farm here. To work with horses is a life-long dream come true for Batt. Batt's family moved here when her father, Richard Batt became CEO of Franklin Community Health Network when she was in high school. After attending college and graduate school out of state, she received a PhD in geology and went on to become an exploration geologist for oil and gas giant ExxonMobil. Batt's husband, Austin Holland, took a job with Nabors Drilling and the couple lived in Houston, Texas, for five years, working on oil fields all around the world. "My husband and I are both from this area and we missed our rural life and our family. So we decided to leave our corporate lifestyle and re-settle back home," Batt said. Liselle Batt helps out a friend in need of a trim. The couple purchased 135 acres in East Dixfield and built a small home and barn off the grid by using solar electricity. 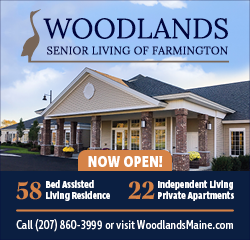 "We built it ourselves with help from Austin's dad, who is a contractor in Peru, Maine," she said. Holland continues to work a rotational job overseas - his office is in Saudi Arabia - while Batt completed an eight-week farrier course in Washington state at the Mission Farrier School. 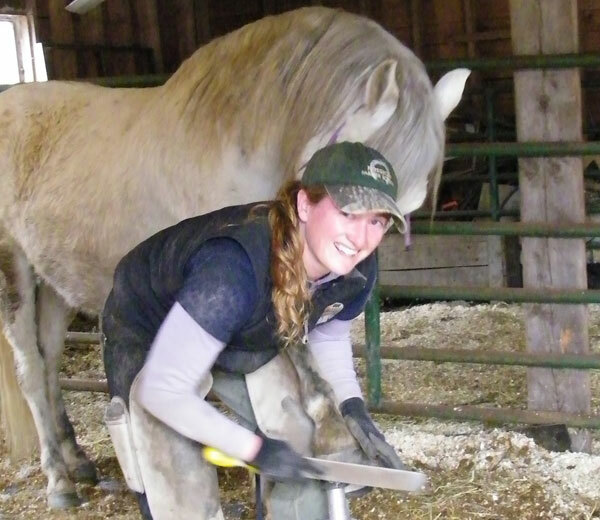 Since returning to Maine fulltime at the start of the year, Batt divides her time between working as a farrier in western Maine and developing their farm. From "chasing goats and chickens out of the garden to working on the never-ending project of finishing trim-work in the new house," Batt is glad to be back here and busy. "I currently trim or shoe nearly 100 horses throughout western Maine and work part-time with longtime farrier Albert Penney in Augusta. A much happier Buttercup after her trim. Her love of horses is nothing new. "I have owned horses all my life; farriery (horseshoeing) combines my love for science and learning with my passion for horses and for working with my hands. I love the idea of running a business that helps me improve the lives of horses around the state, plus I get to take my dog to work," Batt said. Her horseshoeing work includes volunteering one weekend every two months at a rescue in Prentiss, Maine, called "Last Stop Horse Rescue," where she trims the hooves of 17 horses. "I use the phrase, 'promoting soundness from the ground-up,' on my business card because the time I have spent as a horse owner and as a hoof-care professional has taught me that proper hoof care is absolutely essential to the well-being of our equine friends," she said. She currently serves as secretary for the Maine Farrier Association and is a member of the American Association of Professional Farriers. 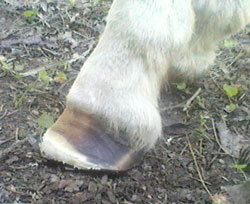 Batt's services include hoof mapping and barefoot trimming; pleasure and performance shoeing including steel, aluminum, synthetic packages in either nail or glue-on applications and therapeutic care for laminitis, founder, navicular and other hoof diseases. Her clinic will be held on Saturday, June 22, "Hoof Care- An Introduction to Hoof Health" at the Ridgewood Equestrian Center, located at 120 Orchard Drive in Wilton. Owner Lisa Bailey is hosting the event. During the half-day clinic, Batt will provide instruction on the basic understanding of hoof health to help horse owners decide whether to shoe their horses, how to ride and stable them, and when to call the vet or farrier. Participants will use cadaver models, digital images and real horses to learn to distinguish between healthy and distorted hooves, to evaluate the quality of a trim or shoeing, and to evaluate footfalls at the walk and trot. $25 fee per participant. Awesome Liselle!! congrats on your new business!! Good for you, Liselle. Welcome to the business and volunteer community. Good luck with your new endeavor Dr. Batt..
How cool is this? Good luck. I am tempted to take in a horse. Wishing you much success! She is my farrier and does a great job. she is awesome! she does my gaited horse, and Jasmine has never traveled better! It's great to have a farrier in the fam! Thanks for the support, everyone!